Know your market and grow your business. 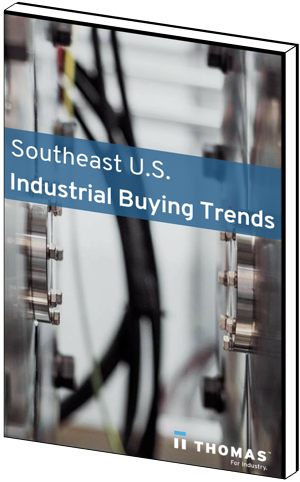 When industrial buyers begin a search for new suppliers in the Southeast region, what do they look for? What products and services are in-demand in Georgia, South Carolina, Mississippi, Alabama, North Carolina, Tennessee, and Florida? How does this local buying activity compare to sourcing activity nationwide? Understanding what's trending in the Southeast can put you in position to take advantage. And downloading our new eBook can give you the insight you need. Over 12 million buyers and engineers per year access the Thomas Network at Thomasnet.com for in-depth information on more than 500,000 North American suppliers. This activity generates petabytes of buyer behavior data, which we regularly review to spot trends and identify opportunities for manufacturers. We recently conducted an in-depth analysis of sourcing activity in the Southeast U.S. and compared it to U.S. national trends. Get the results of our analysis in this eBook.